Since being diagnosed with autism at age 10, my son Mitchell has been a member of the CAN Hockey Program. This October marks his third season with the CAN Surrey Stingrays. I have wanted to properly share my thoughts about CAN Hockey for some time now. From the coaches and volunteers to the unique dynamics and benefits of the program – each and every facet has been so fantastic. But beyond the skill development and experience of playing hockey, this program has given us far more than we ever could have expected. At the tournament this past spring, I was struck by three experiences in particular that I wanted to share. Mitchell (left) celebrates with teammates at their 2018 tournament in Kelowna. The first was the genuine feeling of being a part of a TEAM. Teamwork is a powerful thing. Something so many of these kids have been searching for. A place where they are actually a meaningful part of something bigger than themselves. A place where they belong. But the team doesn’t end with the kids. It extends to the families, which brings me to my second experience. The undeniable support. And I don’t mean for the kids – CAN provides this in spades. I mean between families. 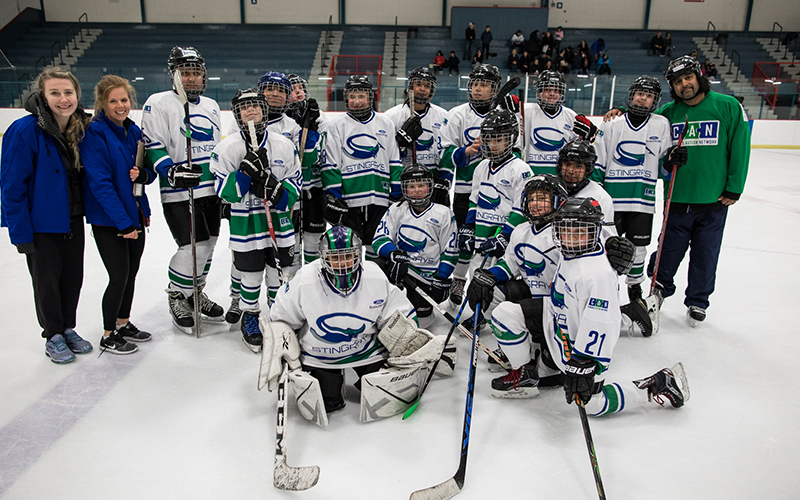 Through practices, team fundraisers and time on the road, the Surrey Stingrays spend a great deal of time together. As a result, our guards are down, there is a comfort zone, and there is established trust. We have always shared the commonality of being parents of kids on the spectrum, but now we SHARE. We have become a support group for one another where we can speak freely and be more candid in our struggles than we might otherwise be. And let’s not forget the siblings. Each player on the team has brothers and sisters who come out to watch them play. These sibling supporters have gotten to know each other too. And by doing so, they now have friends who truly understand what it is like to grow up with a sibling on the spectrum. Most importantly, they learn they are not alone. Like the parents, it is essentially another little support group. The third scenario I witnessed at the tournament almost brought tears to my eyes. 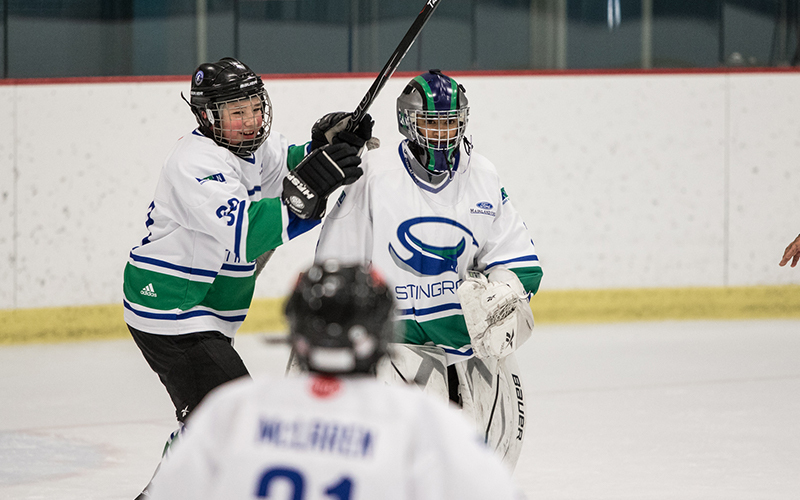 After a shift, one of my son’s teammates returned to the bench visibly upset about something that had happened on the ice. From what I could tell, he was in full “shut down mode” and was going to require some focused intervention. The MOST AWESOME part was that the intervention did not end up coming from the coaches or the volunteers. It came from the players, as a team. They all rallied around their dejected teammate, encouraged him, and turned the moment around. In an instant, the situation had been defused and the player was out on the ice for his next shift. I cannot put into words what it is like to see my son be a part of a team like this. Mitchell always dreamed of playing hockey. In addition to making his dream come true, CAN has given him a second home where he feels welcomed and accepted. CAN has given this to our entire family. 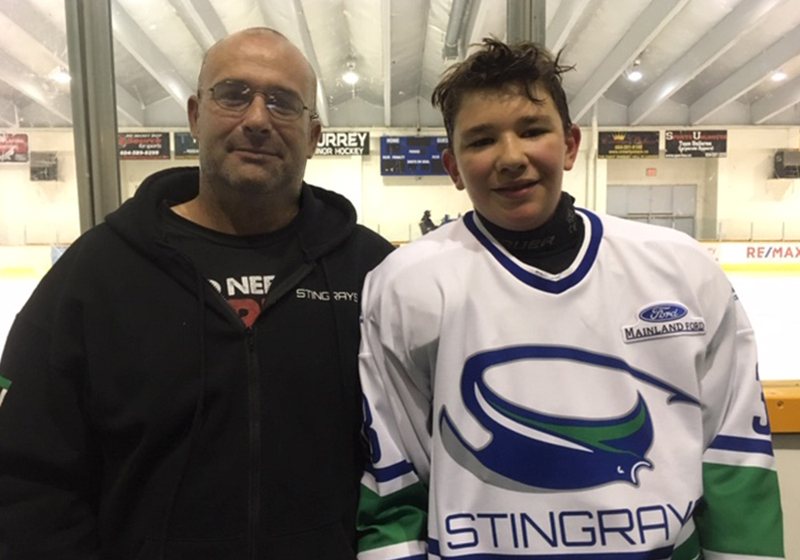 Gary and Mitchell Bryant at the Surrey Stingrays’ first practice of the 2018-19 season. By offering CAN Hockey, you have created a very rare, very unique support group that has helped us in so many ways. Because Mitchell received a relatively late diagnosis, he missed out on a lot of intervention. We are still learning about what it means for him to have autism. Being able to share our experiences with families that we trust has been invaluable. It is about 20 kids, desperate to belong, who have found a second home wearing the same jersey. It is about the irreplaceable community of support that every family member gets to be a part of. Beyond hockey, this program has a much deeper, far reaching impact than I could have ever expected. This is something real special, folks. Thank you.